Post based on Swart et al., Nature Climate Change, or see a less technical summary. Arctic sea-ice melts in summer, reaching a minimum each September, before refreezing through the winter and a maximum extent in March. 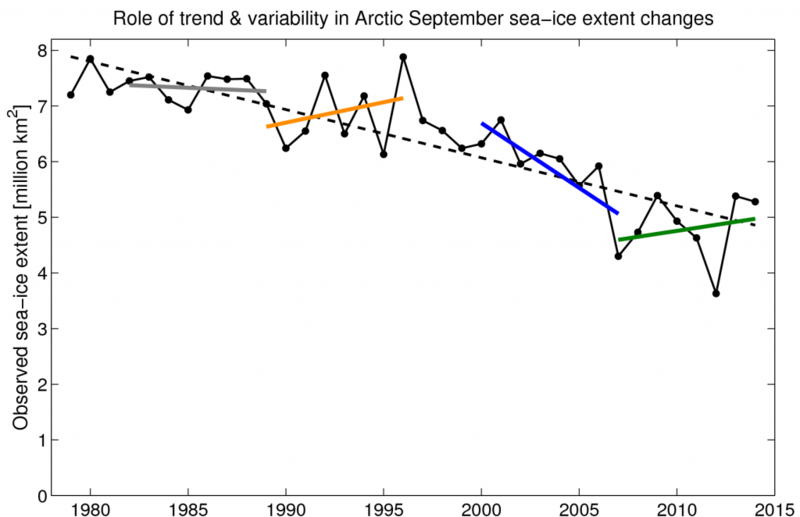 Over the past 35 years, the extent of September sea-ice has reduced by about 35% overall. But, this decline has not been smooth. The linear trend over the second half of this period is larger than over the first half, suggesting an acceleration, and in 2007 and 2012 the summer extent was dramatically lower. Estimates of the volume of sea-ice suggest even larger reductions, although necessary historical observations of the thickness of sea-ice are less comprehensive and the uncertainties are greater than for extent. The CryoSat-2 and SMOS satellites are now measuring sea-ice thickness from space, but only during October-April because the presence of melt ponds on the ice in the melt season confuses the thickness retrieval. The available thickness data also shows year-to-year variations in the volume of Arctic sea-ice, similarly to the extent observations. The extent minima of 2007 & 2012 produced some dramatic claims by a handful of climate scientists and caused much speculation that we would soon see a summer which was ‘ice-free’ (this term is reserved for a year with less than 1 million km2 of sea-ice). However, most climate scientists were more cautious. Although a human influence on Arctic sea-ice has been detected, the weather in both 2007 and 2012 was particularly favourable for melting sea-ice, and there was no clear evidence that these weather patterns would continue each year. In contrast, 2013 & 2014 had larger sea-ice extents than 2012, leading to some media speculation that there was a sea-ice recovery underway. Is this the case? Back to the bouncing ball analogy – the hill represents the long-term downward trend in Arctic sea-ice due to increasing global temperatures and the bumps introduce changes from this smooth trajectory. These erratic bounces could be in either direction, causing an apparent acceleration or temporary reduction in melt rate. Figure 1 shows the observed September Arctic sea-ice extent (black), a long-term linear decline (dashed black), and some deliberately chosen 8-year periods (colours). At various times there is no change, a sharp decline and apparent increases in extent, similarly to the ball bouncing erratically downhill. Figure 1: Observations (black) of Arctic sea-ice extent in September. The dashed black line represents the long-term linear trend and various deliberately chosen 8-year linear trends are shown in colours. The most recent 8-year trend, starting from the extreme low of 2007, happens to show an upward trend. 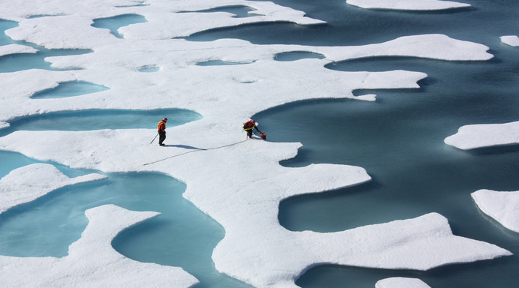 Does this mean the Arctic sea-ice is recovering? No – it is a bounce within a long-term downward trajectory. Similarly, the 2000-2007 trend could have been partly due to a bounce in the opposite direction. Kay et al. (2011) suggested that up to half of the sea-ice trend up to 2005 was due to natural variability, and Day et al. (2012) concluded that 5-30% of the recent trend could be due to variations in the Atlantic Ocean. But what about the climate models? Stroeve et al. (2007) suggested that the CMIP3 global climate models (GCMs) were showing less dramatic reductions in sea-ice than the observations. The latest generation of GCMs (CMIP5) have some simulations which do reproduce the observed trend. And, what do these GCMs say about the likelihood of the observed ‘bounces’ in Arctic sea-ice? Figure 2 shows the probability distribution of all 7-year trends from the CMIP5 historical simulations from 1979-2013. 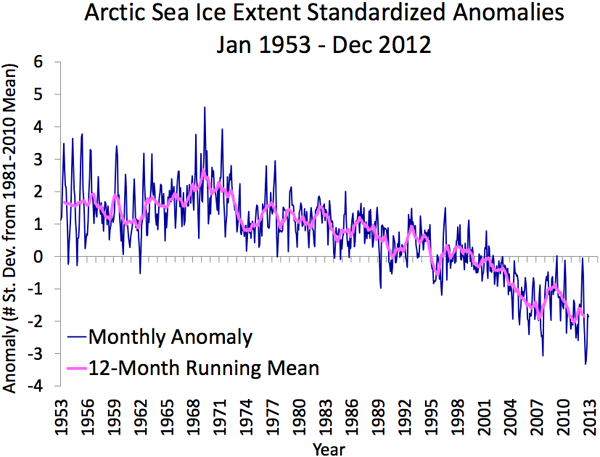 Short periods with no apparent sea-ice decline occur regularly in this period. Swart et al. demonstrate that periods of more than a decade with zero trend are not unusual and that they occur in the simulated future also. 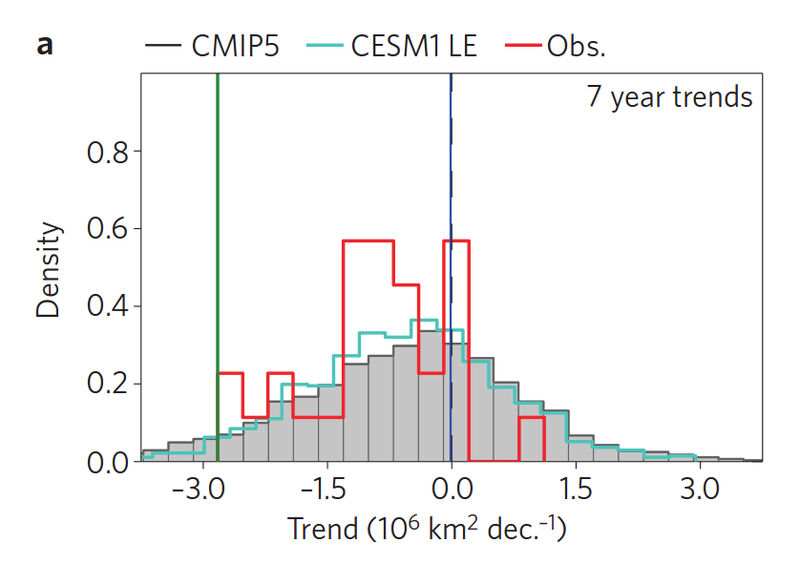 Figure 2: Distribution of 7-year linear trends in September Arctic sea-ice extent, for CMIP5 (grey), CESM Large Ensemble (cyan) and observations (red). The observed 2001-2007 and 2007-2013 trends are highlighted in green and blue respectively. Note that the Swart et al. analysis was done before the 2014 minimum so the paper uses 7-year trends and examines 2007-2013 and 2001-2007 as the two extreme cases. The analysis was also repeated with a large (30 member) ensemble of simulations with the CESM GCM. In this case, the difference between the simulations is solely due to the experienced weather which varies from case to case. Interestingly, the range of trends seen in this single model is very similar to the entire range of CMIP5 GCMs, suggesting that a large fraction of this range is due to internal climate variability and not due to differences between the GCMs themselves. When will the ball reach the bottom of the hill? The IPCC AR5 took the unusual step of only using five GCMs for its overall assessment of future Arctic sea-ice because many of the simulations were not deemed adequate. The IPCC concluded that it was likely that the Arctic would be reliably ice-free in September by 2050 (where ‘reliably ice-free’ means 5 consecutive years with less than 1 million km2 of sea-ice), assuming high future emissions. The expected outcome is that the long-term decline in Arctic sea-ice will continue as global temperatures increase. There will be further bounces, both up and down. Individual years will become ice-free sometime in the 2020s, 2030s or 2040s, depending on future greenhouse gas emissions and the natural variations. But, even at the bottom of the hill the ball will continue to bounce – not every year will have zero ice in summer. The bounces will become smaller if global temperatures continue to increase, and other summer and autumn months will also become ice-free. However, in future scenarios with sharp reductions in greenhouse emissions, the Arctic sea-ice recovers slightly as global temperatures decline. 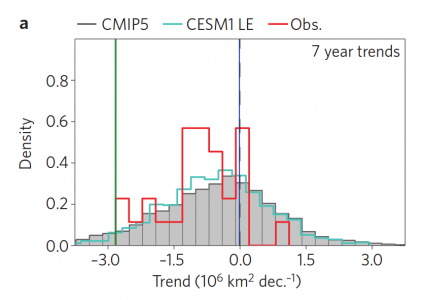 Is Stroeve et al 2007 the last word on the observations? In particular the early parts of the record are based on Rayner et al 2003, which IIRC includes all sorts of jiggery pokery to fill in the gaps. Would you get the same story of underprediction by models with the Meier et al figures, which are observational rather than interpolational? The post-1979 observations are all satellite based so are fairly robust. But before that there is interpolation based on limited observations. There is a new HadISST2 dataset about to be released I think, and ongoing efforts to improve the pre-1979 data. Some extra satellite data has been recovered from the 1960s also. Meier et al data not final answer but I think comparing with pre-1979 is harder because of these issues. Yes – that’s what’s in the Meier et al paper I linked to. Presumably this is the best estimate we have at the moment? I think there is other satellite data recovered too. but this will be updated. If macro weather patterns are primarily the result of ocean/atmosphere coupling then how would the above graph handle known changes in the PDO AND the AMO, since the latter seems to be somewhat neglected. Emphasis tends to be on PDO/ENSO when we should look, IMO, at the combined interplay of the oceans. Isn’t that the whole global teleconnection idea, just that, which meteorologists use daily to earn a crust? So PIOMAS at almost two standard of deviations above trend does not a trend change make? LOL! If the data was two SD the other way you would be screamimg for us to quit having children and commit suicide to “save” the planet. Please keep the discussion scientific. You do not (and cannot) know what I would say if the data was the other way – please don’t make such assumptions. In fact, I have publicly criticised those who have made wild claims about Arctic sea ice before. It is a little bit misleading to say “speculation in the media” when in fact this was based on statements by climate scientists including Comiso, Meier, Wadhams, Maslowski, Flannery, Serreze and Shepherd. But I am aware of your comments that you link to in your reply above. Thanks Paul – yes, some climate scientists did make some dramatic predictions in 2007 and 2012 which made media headlines. I implied this by the next part which says ‘most climate scientists were more cautious’, but I will make that more explicit. As you note, several of us have criticised those claims, some of which continue to be made. But that does not make media headlines! It’s highly misleading to place Wadhams and Maslowski in the same list as Serreze and Cosimo (to name the four on Paul’s list I’m most familiar with). My understanding is that mainstream climate scientists now expect virtual ice-free climatic conditions in the Arctic summer (i.e. <= 1M sq meters in September as often as not) by about 2040-2050. The first breach below 1M sq meters will probably happen in the 2020s or 2030s. That's still an "Arctic Death Spiral" in my book. Ed, I think you need to distinguish much more carefully between the views of outliers like Wadhams and the mainstream cryosphere community (e.g. Serreze/NSIDC) to avoid misunderstandings like this. As it stands, your response seems to indicate that you agree with Paul that Serreze, for example, was responsible for the overblown media response. Hi DeepClimate – yes, I agree that Wadhams and Maslowski (2013-2015ish) have generally made far more dramatic predictions than Serreze (2030ish). Ed with hindsight I should have stuck to the bouncing ball analogy! What I’m suggesting is that internal variability(macro weather) changes the topography of the hillside in ways we can’t predict ie one can imagine a hollow in which the ball settles and even remains for an indefinite period. Thanks for the comments. The shape of the hill is set by global temperatures with the bounces due to natural factors. The AMO is a leading candidate for producing the bumps in my view, though the Pacific may well be playing a role as well. It is the combination of all the factors, coupled with the day-to-day weather variability, that we see reflected in the sea ice observations. Disentangling all the factors is not an easy task though! How about looking at the longer cycles? While there may (should) be a long term downward trend (GW since the end of the LIA) over the past 100+ years, there have been numerous decades long opposing trends; with the most recent being a decades long expansion leading up to your starting point, in Fig 1. Perhaps, a new decades long upward trend has begun . . beginning in 2007, or so. After all, it was due to reverse course once again. Given that the reason for the Arctic variability during the lowest three months of extent is not known, it appears that predictions are pure speculation. The years 2013 and 2014 were warmer than 2012 but the loss in September was less states very clearly that no one really knows. However there is a very simple reason for the variability. The Arctic cyclone in August 2012 and 2016 occured for the same reasons. Human influence from my observations is almost negligible. Hi Martin – I think you need to look at the bigger picture. The atmosphere and ocean temperatures are not the only factor that varies from year to year – the storms are important too as you suggest. However, over the past 35 years the summer sea ice extent has dropped dramatically – this is the human influence. We do not expect every year to set a new record.